Agility is a members' only skill that helps you regenerate your run energy faster (either by not running, resting or listening to a musician). It also allows you to use certain shortcuts around the world, that allow for faster travel. This guide will show you how to earn the best experience, and how to reach level 99. 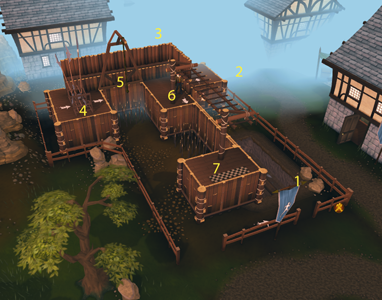 For first starters to Agility, you have two options – the Burthorpe course, or the Gnome Stronghold Course. Both offer very similar XP rates and have no requirements, except the Burthorpe course is much easier to access for new players, as the Gnome stronghold course requires a long trek across Kandarin. However, if you do decide to make the walk to the Stronghold, you can complete the quest ‘The Grand Tree’ for a healthy 7,900 Agility XP reward, which should help boost a bunch of levels – you should go from level 1 to 25. An alternative to those that don't mind a few extra clicks are clockwork mice. These can be made in a player owned house with a clockwork mechanism and a wooden plank. These toys, when caught, give 3 Agility experience. The way to do this is to get your hands on quite a few of these, wind them up, and release them in a small space, to make them easier to catch. The Skullball course is a type of Activity where you have to kick a skull through 10 goals to get Agility experience. However, everything is timed: the less time you take, the more experience you get. So don't take your time doing it! I don't recommend using this course instead of Gnome, seeing as if you take too long to do it, the experience won't be quite good. However, if you're bored of the Gnome course and want to vary your training a little, this could be a good place to go. The entrance to this course is located to the east of Canifis, in the Haunted Woods, and you must have a Ring of Charos to be able to enter. Either through quests (The Grand Tree, Stolen Hearts + The Diamond in the Rough, Recruitment Drive and Cold War are good ones to begin with. However, Cold War requires level 30 Agility, among other requirements) or training at the Gnome / Burthorpe course, the next useful course you will unlock is at level 35. 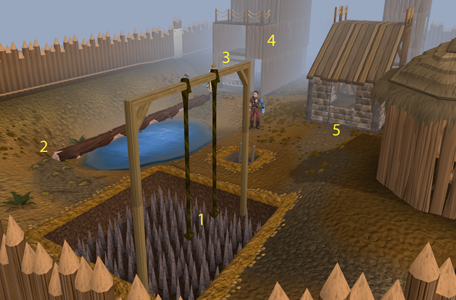 This course is the Barbarian Outpost Agility Course – however, unlocking this requires completion of the Barcrawl miniquest. This course is much, much better than the other two, offering a much healthier XP rate for its level. It is also good to complete the Barcrawl miniquest now, to save yourself from having to do it later when you unlock the Barbarian Advanced course. Remember, however, that from now on, you can fail and be damaged in the courses, so bring some food! At these levels, players will unlock the Ape Atoll Course and Wilderness Course respectively. There have been many debates about which of the courses is actually better, as they are both similar XP rates with differing pros, cons, and requirements. The Ape Atoll course is however not recommended to be used at level 48 Agility – your failure rate will be high at this level. However, one can make incredible benefit from the use of the Surefooted Aura if they have just unlocked the course. 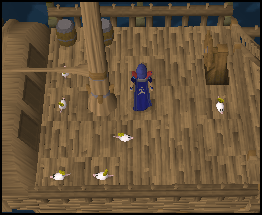 This allows 20 (40 from the Greater version) minutes of guaranteed flawless Agility training, which to otherwise achieve at the Ape Atoll course, requires level 75 Agility. 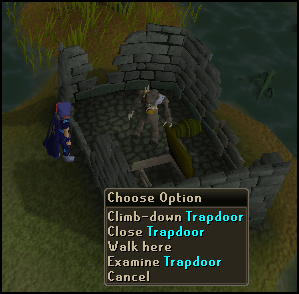 The Wilderness Course also has a high fail rate right off the bat, and is also much more dangerous – one may die at any time to a nasty player-killer roaming around the high-level wilderness. 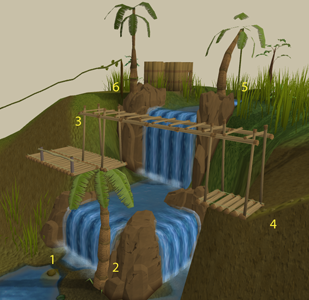 However, this course has no quest requirements, unlike the Ape Atoll course, which requires completion enough of Monkey Madness until the player has unlocked the Ninja Monkey Greegree. You must own a Ninja Monkey Greegree, and be warned – medium-sized Ninja Greegrees will not work when attempting to use the fairy ring shortcut unlocked during Fairy Tale – Part III. The course to use is up to the player. Either way, use one or the other until level 75, but then swap to Ape Atoll regardless. At this level, it becomes much better than the Wilderness due to the 100% success rate of obstacles. If you have unlocked the Elf City of Prifddinas by completing the quest Plagues End, you will be able to use the Hefin Agility course at level 77 Agility. This course is highly recommended all the way to 99 – the XP gained per lap increases every 5 levels capping at level 97, and you will also gain prayer XP alongside it as well as many nice rewards, including tokens that increase your Agility XP for a lap, lore pages required for the Completionist Cape, emotes, and the cosmetic Prifddinas worker’s outfit. One tip for reaching level 80 Agility is to complete the quest Ritual of the Mahjarrat – this quest has very high requirements, including quests such as While Guthix Sleeps, and 3 70+ stat requirements – one of these is 77 Agility. Upon completion, the XP lamps if used on Agility can rocket you right up to level 80 if not very close, alongside the base Agility XP reward. At level 80, you are 5 levels away from unlocking the Advanced Gnome Stronghold course. However, you can use Summer Pies to boost your Agility level to 85 and use the course. (Which I highly suggest you do – Ape Atoll and the Wilderness are very slow courses to use at this level.) At level 80, you should require one bite per lap (however sometimes you will manage to fit 2 laps into one bite) and from 81 and further you will require one bite every second lap. The Advanced Gnome course is a very good course, offering a good XP rate (just under to 60,000 XP an hour, depending on how many perfect laps a player can pull off) and the ability to unlock the Agile Legs after 250 successful laps.For this course, complete the first 3 steps of the regular Gnome course and then follow the steps in the image. The same process can be done again at 85, except this time at the Barbarian Advanced course. Summer pies can be used to boost your Agility level to 90 and use the course, offering the best XP ingame for Agility without any kinds of XP boosts, besides the Hefin course. For this course, complete the first two steps of the regular Barbarian course and then follow the steps in the image. At level 93, you will cease to fail this course and will have smooth sailing for the final stretch to 99, and beyond. This course is also good as it unlocks the Agile Top after 250 successful laps, which redues your weight by a significant 12 kilograms. The art of a perfect lap is a tricky one. It requires accurate clicking and perfect timing, and is particularly tricky at some of the higher-end courses. It is probably most difficult at the Gnome Advanced Course, as it not only requires a tricky manoeuvre but is partly luck-based. A few specific obstacles will be looked at in the obtaining of perfect laps, and the lower-level courses will be left out as they are for the large part very simple and can normally be done with a perfect lap by spam-clicking the next obstacle to come up whilst traversing the one before it. A second or two can be shaved off the laps at Ape Atoll by using this clicking trick. It is very simple to do, and most people figure this out early on at the course. When crossing the rope swing, right click on the palm tree used to exit the course. This tree can be clicked on as your character still traverses the rope swing, and as soon as you land you will find yourself running up to the tree and climbing down it. This part of the course is one of the trickiest parts to get right for a perfect lap. As you run across the wall, clicking on the bar swing as you exit the wall will result in your character taking a solid few seconds of your precious time to do a run-up. However, you can avoid this with a few well-timed clicks and a bit of luck. First, you have to know how the bar swing works. When you click on it to initiate the obstacle, there are 3 potential spots to start from, and thus 3 people can swing side-by-side simultaneously. Each square with a rune on it depicts a potential spot to jump from. If you click on the bars as you exit the wall run your character will walk in a set path to any of these 3 spots (which appears to be randomly selected) and then do a run-up to the bars and finally initiate the obstacle. The trick is to click on any one of the three spots on the ground before clicking on the bars, and then your character will be almost immediately ready to swing. For example, if you click the middle of the three spots, and the game selects that as your start point for the bars swing, you will begin the obstacle with almost no hesitation whatsoever. This is required for a perfect lap, thus making the Gnome Advanced Course the most difficult to be fully efficient at. Of all the laps you do perfectly, there is still only a 1/3 chance of you getting the quickest lap time possible. Another example is if you click on the western of the 3 spots, but the game selects the eastern start point to jump. Your character will walk 2 spaces and then begin the swing, which is a significant waste of a few seconds. Thus it is HIGHLY recommended to use the square depicted with the Water rune when exiting the wall run. This is a simple trick that will only save you around a second, but if you click in front of the barrier to exit the course, instead of the barrier itself, your character will run to it instead of walking. Make sure you click the barrier just as you get there or else the second you just saved will be lost. There are quite a few tricks that can make the course faster, on almost every obstacle in the advanced course and one that can be used in the regular course. The same as exiting the Gnome Advanced Course, this will save you a step of walking towards the obstacle. Click on the square in front of the climb BEFORE clicking to begin the obstacle. This obstacle can be cut down of a significant amount of time if one clicks in front of the launcher before activating it instead of just clicking on it. Just clicking on it results in the character slowly walking forwards for a significant amount of squares before launching instead of running, and running will obviously halve this time. This next tip doesn't save time by itself - it actually makes the lap take longer - but when used in tandem with the next tip, it is very helpful at reducing lap time, and regardless it makes the course slightly easier. When exiting the course, there are 3 lanes that can be slid down on the rap - you will want to use the Northern lane, which can be done by clicking the respective side of the ramp. This requires you to be in EoC mode. If you’ve got level 30 Magic, your laps at the Advanced Barbarian Course are going to be slightly quicker than otherwise. As you exit the course, you can use the Surge ability to shoot from the exit ramp straight to the rope swing, getting you there in a second or two less than running would of. However, you need to do some certain things to get this right and not Surge into the side of the rope swing, as doing this is a big way to slow down your lap time. Whilst killing monsters out in the world of Gielinor, you have a very small chance of getting a set of Brawling gloves off of the rare drop table. One of the possible skills to get the gloves in is Agility. These gloves give 1.5x the normal experience you would get per lap in a PvP world. However, the experience is 4x the normal experience you gain per lap if you train Agility in the Wilderness! This is a good opportunity to go train at the Wilderness Course, seeing as if you use these gloves, you get an amazing 2285.6 experience per lap. Leave the gloves unequipped, and wear them on the last obstacle, when you're about to get the bonus. This doesn't waste your charges, while still being the best experience per hour in the game. Getting these gloves is worth a try. If you win these boots from the Treasure Hunter, you can wear them and get Agility experience while training other skills or running. They activate at a maximum rate of once every 45 seconds and will give you Agility XP based on your level – as long as you have Silverhawk feathers charging them, which are a reward from the Treasure Hunter also and can be purchased from The Grand Exchange or other players. These Boots are highly controversial – many players have complained at the fact the boots ruin the skill completely as they have changed Agility from a slow and click-intensive skill to one that requires literally zero effort. Some players would rather train the skill than shell out millions of coins to fund the boots, and some prefer to just train it in general, while some players actively participate in the use of the boots. This inconsistency leads some to believe Silverhawk Boots are causing slow devaluation of the Agility skill. Serenity Posts After unlocking the Elf City, at 75 Agility the player can travel to the Hefin district of the city (North-north West of the Lodestone) and balance atop any of the six Serenity posts. Every day, the player can earn 20,000 Agility XP (before boosts) by simply following the pose performed by Lady Hefin, and changing pose according to her. This takes roughly 10 minutes, and is a good way to relax, chat with a few people, and gain some nice XP. Tireless Run Scroll - Boosts by 2 levels. Agility Potion - Boosts by 3 levels. Abyssal Stealth Scroll - Boosts by 4 levels. Summer Pie - Boosts by 5 levels. Spicy Stew (Yellow Spice) - Reduces or boosts by up to 5 levels. God Banner - Boosts Agility by 5 levels for half an hour, once a day. Well done! You have now reached level 99 and are a true master of Agility. Now that you have reached the maximum level, you can buy something very special: the Agility Skillcape! 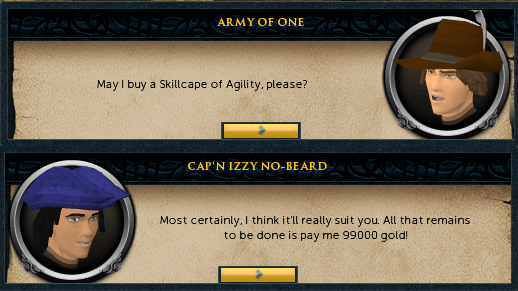 To buy it, you must see Cap'n Izzy No-Beard in the Brimhaven Agility Arena. The Cape costs 99,000 coins to buy, and comes in two forms: an untrimmed version if Agility is your first 99, or a trimmed one if you have others. A special hood also comes with the cape, however it has no bonuses. The cape can be operated to temporarily boost your Agility to 100. The cape's stats are the following. And last but certainly not least: the emote!